Cigars smokers are an easy crowd to pick on. We are low in numbers, the least vocal, and most of us are just too damn busy. The whole reason that we smoke cigars is to relax, reflect, and sip a premium single malt with other like minded people. To make matters worse our hobby has been co-opted by visions of mobsters, corporate imagery, and the opulence of the super rich. So when you add up our vulnerabilities and liabilities the only thing left is our awareness. The more of us that are aware of the threats to our culture the more we can rally behind those that are fighting in our favor. Furthermore, awareness facilitates our ability act locally, evangelize our cause in everyday conversations, and contribute to individuals and/or groups on our side. We can no longer wait idly while government forces plot against us unjustly. To that end, I am glad to present the Cigar Smoker’s Rights Hub. Consider this a one stop shop for all things related to legislation that threatens cigar culture in America. Famous Smoke has done all the heavy lifting to amass the legal data and news in one central repository but it's up to all of us to put our shoulder to the wheel of progress. EASTON, PA--(Marketwired - March 30, 2017) - Famous Smoke Shop, the leading online distributor of discounted premium cigars, has debuted their new interactive Cigar Smokers' Rights Hub. 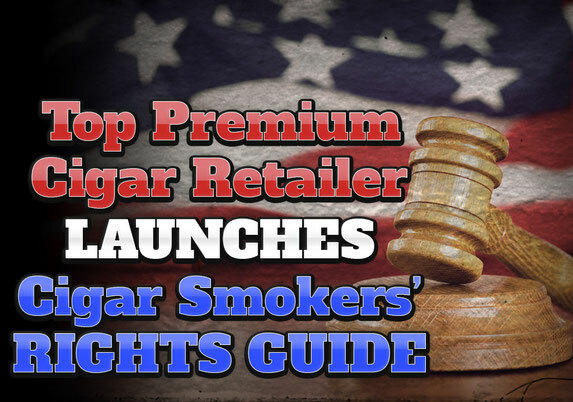 Crafted in response to the US Food & Drug Administration's 2016 Final Deeming Rule regarding premium cigars and other tobacco products, the Famous Smoke guide presents cigar enthusiasts with a history of legal actions affecting the tobacco industry. The Smokers' Rights Hub also offers cigar smokers a detailed understanding of how FDA's new regulations will negatively impact the premium cigar industry, and the legal challenges that have been mounted against the agency's sweeping new rules. "The rights of adult cigar enthusiasts to purchase and enjoy a completely legal product are quickly going up in flames." Arthur Zaretsky is the president and owner of Famous Smoke Shop, who has launched a Cigar Smokers' Rights Hub -- a website devoted to educating consumers about the Food & Drug Administration's Final Deeming Rule concerning premium cigars. FDA released 499 pages of new and strict cigar regulations in August of 2016, filled with measures, rulings, definitions and fees that "completely overstepped the authority FDA was given by Congress to regulate tobacco," says Zaretsky. His company's goal is to inform customers -- and cigar enthusiasts at large -- about how these rules are shortchanging consumers, unfair to business and in violation of US law. "The agency is going at this regulation, and the costs associated with compliance, blindly. FDA has failed to perform an adequate, legitimate cost-benefit analysis of the Final Rule's economic impact on small businesses, as is required by the Regulatory Flexibility Act," says Zaretsky, who adds, "the FDA is defying the law."